The logogram you see here may look strange, but it is nonetheless an official symbol of Mensa somewhat crudely drawn because of my limited talents as an artist. It was adopted by the Mensa I[nternational] G[eneral] C[ommittee] ca. 1971 as an alternative to the familiar square-cornered table. The designer was the same Peter Devenish who created the standard logo. About 1970, when the logo was being designed, I was American Mensa Chairman. After the selection had been made and was in the process of adoption, an Australian Mensan (whose name, I'm sorry to say, I don't remember) commented in a letter or article that the logo wasn't appropriate for a "round table" society. I immediately recognized the appropriateness of that observation and wrote to Peter asking whether he could modify his design. He did so, but it was too late to institute the change. Next, I got the IGC ( now the IBD) to pay Devenish a nominal sum for his design and to adopt it officially as an alternative. Mensa was too poor and too disorganized to proceed with a conversion forthwith, and the present logo became entrenched. But, so far as I know, the rounded logo is still an official emblem. One of my many projects for Mensa is to bring the round table back into the public eye. It can be done and should be done. A letter (25 May 1971) from Peter Devenish to Margot Seitelman, forwarded with a note to me, requesting a nominal payment (£12) for the design of the alternative symbol. A memo from Victor Serebriakoff (1 July 1971) referring the payment to the whole IGC (International General Committee) with his endorsement. I do not have the minutes of an IGC meeting later that year in which the payment was authorized and the revised symbol was adopted as an alternative to be employed when it was convenient to do so. A Xerox copy of Devenish's original drawing in which the black areas are noisy gray. I scanned this copy, retouched the gray, and posted it here. Click on the symbol to see enlarged image. please, or indicate what rule I have violated? >>please, or indicate what rule I have violated? 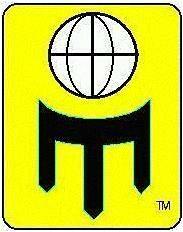 adopted by IGC in 1971 [or '72] as I stated in the link from the symbol itself. IGC actually paid a (nominal) fee for the right to use the curved symbol. society, not to an individual. properly, not use you as a catspaw. >OK, I will apologize for not notifiying you before I removed your link. >logo committee is in charge of what is appropriate and what is not. >Take it up with them. >Excuse me? And you are who? a non-contributing member I would still find the high-handedness objectionable. of maintaining a Web page. minimal "due process." This isn't what Mensa was intended to be." rhetoric does NOTHING to sway me, and in fact, has the opposite effect. bruised ego any, I'll put this whole matter another way. information before taking an action that affects others' interests. none of my business, nor are mine theirs. because of official attention to others' motivations rather than to facts). harm the society as well as particular individuals. spirit, I'm sure we'll reach a good conclusion. It isn't radical to suggest that committees in a society of Mensa's kind need a better reason than it violates our rules before acting to suppress members' views on matters that are arguable.